Most of my professional live I had worked in the field of graphic design in my own company in Iceland and later in Denmark. I also worked for many years as a costume-and set designer at the Icelandic State Broadcasting Service, RUV. Some years ago I realized that the moment had come to try something totally different. Something craving, out of the box for me and which demanded daring attitude and where I could use some of my lifelong experience and education. By that time the challenge did present itself in the form of an advert from the Lolland community. They wanted to sell their old and now emptied but prestigious retirement home. The purchase agreement was signed late 2007 and I got the keys by the start of 2008. And then started the time of total renewal of the whole house together with some expansions. And the scene was orchestrated by the “old” set designer which totally enjoyed the mission. All of the beds in the hotel are specially made and to ensure the guests good sleep also with quality pillows and pillow and blankets. Almost everything else of the interior in the hotel I have bought for at the different flea markets in the area to recreate an atmosphere of a building from 1943. Mission accomplished and at the 1. of April, 2009 the Hotel Lolland opened formally and has been open ever since. The overall reception has been astonishing and I have been able to create an atmosphere with personal service, where the contact with the guests from the many countries has given a new life experience. The personal service has meant that guests have returned to Hotel Lolland year after year. If you take a look at the pictures you can see me together with Helle Thorning-Scmidt, former Prime minister of Denmark and the other person is Henrik Holmer, former mayor of Vordingborg Municipality. The picture is from the time when I designed the election campaign for the Social Democrats before the municipal election in 2005. Of course the Social Democrats won and Henrik Holmer became mayor of the united municipality which was created after merging the municipalities of Vordingborg, Langebæk, Præstø and Møn. I have been interested in flying from an early age and in 1972 I got my first flight certificate. 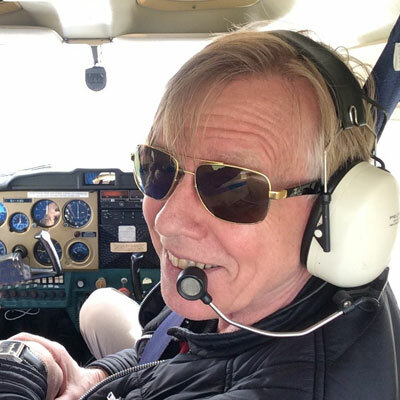 When I moved back to Denmark in 2001, I became a member of the Friends of DC-3 Association, which aims to take care of the only DC-3 aircraft in Denmark which still is able to fly. When the time is to it and the weather’s nice, me and my good friend.Rafael spread the wings. I have traveled extensively in my life and worked on various tasks marketing and promoting companies and products. In 1991 Estonia declared its independence and cut the ties to Mother Russia. Iceland became the first country in the world to declare support to Estonia. 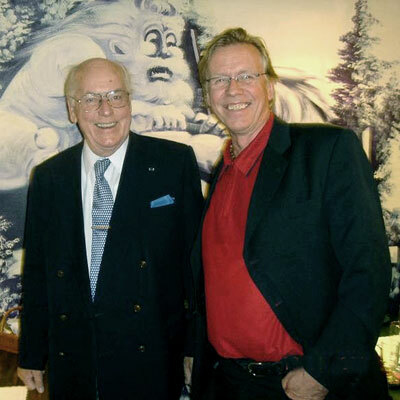 After the declaration I met with Estonia’s first president, Mr.Lennart Meri. I was born in Denmark, but have lived most of my years in Iceland. My parents were both Icelanders. In 2001 I moved again “home” to Denmark with my Danish citizenship. I did create my own advertising agency with the name of Inart shortly after the arrival. 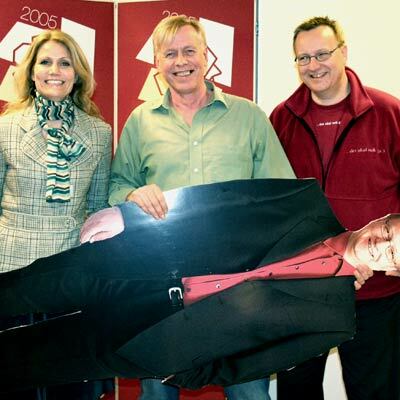 In the years between moving and throwing myself into the hotel business I operated Inart from Vordingborg, where graphic and marketing related puzzles were solved for several customers. I can still encounter many of my works in the form of various business logos around in Iceland and Denmark. Most have passed the trends and demands of the time and are still valued. Throughout the life I have stumbled upon many unusual tasks, projects which required planning, original thinking and solutions. There has not been a lot of thinking “within the box” as they say. 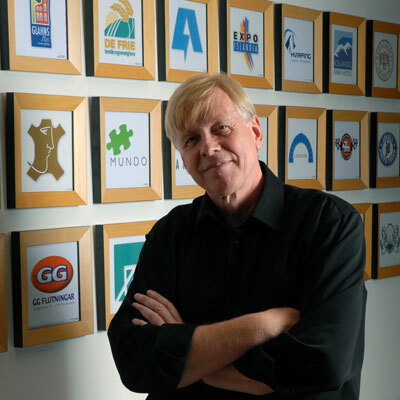 I had been working on various projects for one of my beloved friends, Michael Läufer, at the time he was responsible for all HR at the company Capsugel. One day Michael called and told me that they had decided to gather all the CEO’s from the 24 Capsugel owned and operated plants around the world. The idea was to gather the director somewhere they had never been before. What about Iceland? The idea was accepted as a very good one and I organized their conference in Iceland accompanied by unforgettable food, drinks and experiences around the country. 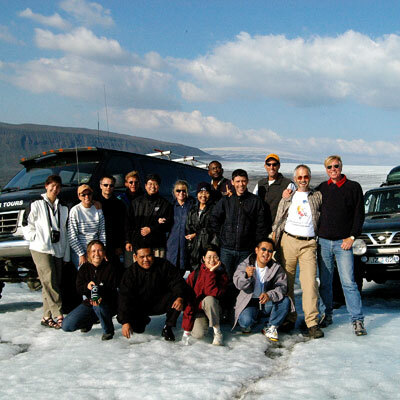 One of the pictures is from the trip and here we are at Langjokull (glacier). close by he famous Eyjafjallajokull Here at the glacier, Michael and me are on the far right. 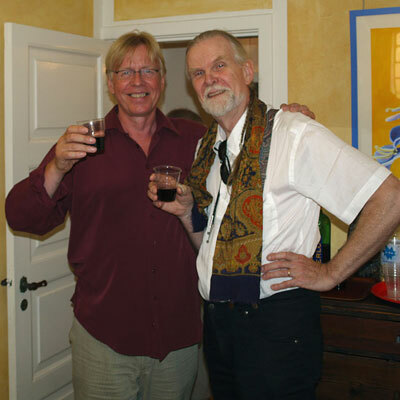 I have chosen to name as a good friend and my mentor, Einar Thorstein, architect, disciple of Mr. Buckminster Fuller “Bucky” and designer, artist and more. We first met shortly after I finished my education at the Academy of Fine Arts in Iceland and the meeting became my life’s greatest lottery win. He has been one of my closest friends, my boss at the Icelandic State Broadcasting Service, RUV. Later Einar Thorstein became the right hand of the famous artist, Olafur Eliasson and worked with Eliasson in his big workshop in Berlin for several years. Einar died in 2015.